Good global governance is a political order that promotes the welfare of all through economic, social, demographic and ecological sustainability and justice. It is a people-centered global governance with the mandate of regulating global issues only without interfering in the internal affairs of nations. The sovereignty of nations is one of the root causes of wars and environmental destruction and many other global evils in today’s world order. Internally, at the sub-national level we have a nested hierarchy of municipal and provincial governments. The actions of these are limited by enforced national laws and therefore there is peace inside a well governed nation. Externally however, the nations still cling to the 17th century Peace of Westphalia notion of absolute sovereignty. — Sovereign nations catch whales when the world community wants to protect that species, they build nuclear reactors and weapons without asking their neighbours for permission, they pollute and plunder the global commons when it brings economic benefits, and they make war when they feel like it. — The time has come to limit the actions of nations by enforced world law. Nations may keep internal sovereignty, but their relations with other nations and with the global commons must be governed by a global authority. This is not a revolutionary idea, nor is it ‘rocket science’; it is just an extension of the existing multilevel governance system with all its problems and advantages to the global level. A good global government must establish a legal framework within which the nations are free to act. The UN must be given legislative, juridical and executive powers in order to function as a global government. The main mandate of a good global government is to solve only problems of global scope, essentially to put an end to war and ecocide. It must not interfere in the internal affairs of nations. –The crisis of the European Union is largely due to the Union interfering in member nations’ internal affairs by asking them to take in refugees, which they do not want. Similarly, the UN’s Responsibility to Protect individuals is to be applied with extreme caution, because it may be abused by outsiders to interfere in local affairs. – The Iraq war, the Middle East conflict and the liberation of Libyans from a dictator demonstrates the risks of outside interference in the internal affairs of nations. 60 years ago the Russell-Einstein Manifesto presented the dreadful alternative caused by nuclear weapons to the world: “Shall we put an end to the human race; or shall mankind renounce war”? The Manifesto also hinted at the root cause of war: “The abolition of war will demand distasteful limitations of national sovereignty.” Today, humanity faces the additional existential threat of ecocide. In order to put and end to war and ecocide we must remove the root causes, which contrary to wide spread public opinion, are not in human nature. It is human nature to want to survive and procreate life, not to make war and ecocide. The root cause of war and ecocide is the globally accepted but faulty political system, which is based on absolute sovereignty of nations. If war and ecocide are to be eliminated, all nations must abandon absolute sovereignty and enable a global authority with legislative, judicial and executive powers to solve global problems while the nations retain internal sovereignty. The global authority, a good transparent global government could be a World Federation or a thoroughly reformed United Nations. Well governed countries have internal peace and protect their own environment. Likewise, a well governed world will have peace and a healthy environment. Peace and environmental protection are safer and less costly than war and ecosystem repair. We call for transparent, trustworthy, good global governance because it makes sense. The time has come to replace globally the law of force with the force of law. Please endorse our call by submitting the completed form below and pass our call on to your friends and to organizations. If many endorse this idea, we shall approach politicians to take action in the direction towards a just and sustainable world. Professor Schnellnhuber proposes the formation of global authorities to cope with the global problem of climate change. Our proposal of Good Global Governance (GGG) is similar but addresses in addition to the environment the global problems of peace and disarmament. Below is a reference and a summary of Professor Schellnhuber’s proposal. … In addition to the reforms and constructive steps each state can make, we should implicitly create innovative concepts to respond effectively to the climate crisis. One crucial concept is the idea of a global democratic society. This society could be represented by a small set of global institutions that support the sovereign countries as assembled within the United Nations in working out solutions to problems that require concerted transnational action. the Planetary Court would be a transnational legal body open to appeals from everybody, especially with respect to violations of the Earth Constitution. In order to dovetail the die-hard system of national governance with the global institutions, a certain percentage of national parliamentary seats should be earmarked for “Global Ombudspeople.” Their prime mandate would be to ensure that the first humanitarian principles as sketched above are observed, not least in the interest of future generations. This is no less and no more than a vision to extend democracy across space and time. Unprecedented challenges like anthropogenic climate change remind us that such dreams need to come true—soon. Humanity’s core issue is survival and sustainability; this rests on two main pillars. The first pillar is peace and security. The second pillar is a healthy environment, supplying vital resources for all. A common misconception is that that war is inevitable due to human nature. However, this is obviously wrong since well governed countries have internal peace without changing the human nature of their citizen. Human nature is wanting to survive, which can be either through war or through peace. Internal peace is achieved by enforcing the law. Police is required for bringing law breakers to justice. Likewise, a well governed world will have acceptable levels of global peace without changing human nature. However, an effective, non-corrupt world government is required for world peace. Nations remain responsible for their internal peace. A world police must bring law breaking nations to justice. As peace is less costly, more secure for all, and more environmentally friendly than war, common sense calls for peace through good global governance. Police action may require violence just like military action in war. However, there is a relevant difference in their mandates. The mandate of police is to implement the force of law. The mandate of military is the opposite, to implement the law of force. Conflicts arise when vital resources are insufficient for all. Many superficial reasons may be given for going to war, but basically wars are fought for survival, for security and access to vital resources. The winners of wars survive, have temorary security and access to resources. The losers suffer shortages or perish. In his book on politics, Aristotle gives a reason for going to war. A citizen of Athens had to have wealth. What if he had four sons and their inheritance was insufficient for each to be a citizen of Athens? The solution was to increase his possessions by conquering the estate of a neighbour. Then all his sons can become citizens of Athens. Another example of survival potential in winning a war is illustrated in the story the chief of the Chical villages in Niger told me. Some one hundred years ago, two brothers in a neighbouring village quarrelled. The weaker one and his clan were expelled and attacked the Chical village. After a fierce battle, only 120 of the 300 Chical villagers survived but they won. Today there are 3000 Chical villagers living near the old battle ground. The losers tried to conquer yet another village. They lost again and got wiped out. The improvement of weapons of war has been much faster and more effective than the development of defence-ability. Furthermore, the production of weapons is much cheaper than the creation of defense systems, if these are possible at all. Fig. 1 illustrates that wars with nuclear weapons cannot be won. Conducting a nuclear war is suicidal, it results in mutually assured destruction. When wars can no longer be won, peace is our only option. Access to vital resources is one condition for peace. Maslow’s hierarchy of needs must be satisfied for all humans. However, the planet Earth is finite and continued growth of human impact will reach a point beyond which not all human needs can be satisfied. Therefore, human numbers, per capita consumption and the use of technology has limitations. There are several signs that humanity is reaching the limits to growth. Climate change, persistent hunger of billions, and loss of biodiversity are warning signals that resource consumption has reached or even surpassed the sustainable level. Getting world population to a sustainable level. This is a politically inconvenient scientific truth, which challenges all individuals and institutions. All three actions are necessary for avoiding an inhumane solution through chaos and bloodshed. According to the the Ehrlich-Holdren formula I = P A T, the human environmental impact on the environment ‘I’ depends on three factors. 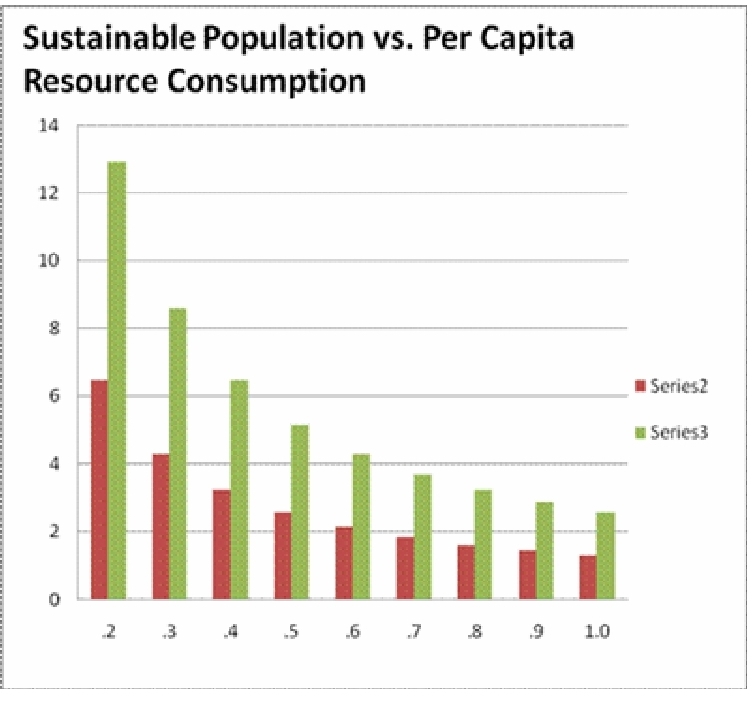 Population ‘P’, Affluence or resource consumption per capita ‘A’, and the kind of technology applied ‘T’. Using the data given by the Global Footprint Network, the enormity of the sustainability challenge becomes obvious. Fig 2 Illustrates the trade-offs between the three steps. A totally renewable resources based world energy system, substantial reduction of per capita resource consumption as well as a lower world population is required to come anywhere near sustainability. Voluntary measures and multilateral agreements between sovereign nations are insufficient to stop growth let alone reverse it. The big nations must give up part of their sovereignty, the carbon and nuclear based energy corporations must wind down, and the rich citizen must reduce their per capita resource consumption. A trustworthy good global government with executive powers is required to legislate and enforce the painful but necessary steps for a just and sustainable world in a humane way. The alternative, global chaos, World War 3 or extinction of the human race is so gruesome, that all reasonable people will opt for the less painful global governance. In addition, with good global governance nations are secure through the force of law and can abolish the costly military. Good global governance is not a crazy idea but a necessity for the survival of human civilization. In an age of reason peace through good global governance makes sense economically, as it is less costly, socially, as it is more secure and ecologically, as it is less polluting than war. Finally, I call for your support of the Science for Peace Working Group on Good Global Governance for a Just and Sustainable World. Our mandate is to raise public awareness of global governance issues. We believe the world is ready for good global governance, which is transparent, trustworthy and just. We are aware of and we warn of the dangers of secretive bad global governance, which may emerge from an elitist new world order. Please endorse our effort by sending an email to goodglobalgovernance@gmail.com, contribute your ideas to the Open Forum: goodglobalgovernance@yahoogroups.ca, and pass this request on to friends. Our website/blog is: goodglobalgovernance.org . 2.Burkhardt, Helmut the Roundtable on Food and Population of the Science for Peace and Canadian Pugwash Group Global Issues Project on November 21, 2011, Ryerson University, Toronto ON Canada). Research: thermonuclear fusion, magneto hydrodynamic energy conversion, renewable energy, appropriate technology, general systems, substance accounting, sustainability, good global governance. Memberships: American Association of Physics Teachers, life member and past president of Science for Peace, member of the Canadian Pugwash Group, and the Canadian World Federalist Movement. *Presentation scheduled for the Canadian Peace Research Association Conference June 3 – 5, 2015, Ottawa. In a scientific perspective there is no shortage of energy resources on Planet Earth. The clean solar power delivered to the Earth’s surface is 10 000 time more than the power humankind is presently derives from oil, coal, and nuclear resources together. 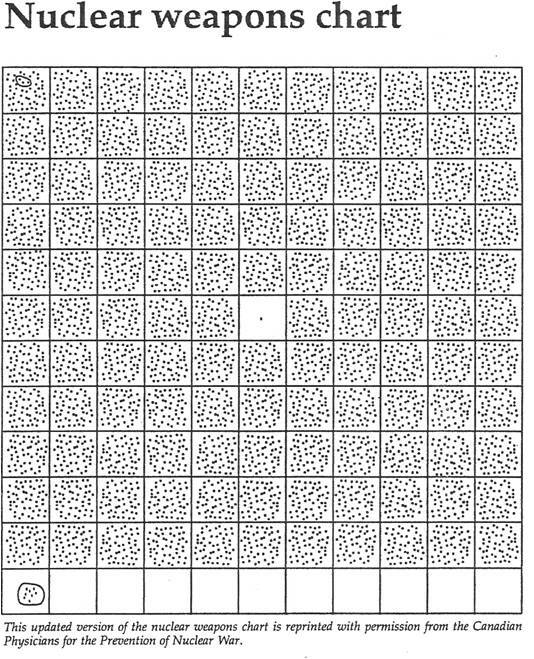 In another perspective, the total power used by humankind today is equivalent to the solar power received by a square of only a 200 km x 200km. The technology to utilize this vast solar energy resource is available today and is improving rapidly. There are two technical options to cope with the intermittency of solar power: an integrated global electricity grid, and large scale energy storage. High voltage direct current transmission makes large area integration feasible. Molten salts, batteries, flywheels, hydrogen or in synthesized liquid or gaseous fuels are some of the technical energy storage options. The economic hurdles for a transition to renewable energy are largely due to the resistance of the established energy industry whose financially strong lobby also contributes to the lack of political will for a transition. By contrast, climate change and other environmental concerns are driving forces for a speedy transition to a clean and more efficient world energy system.